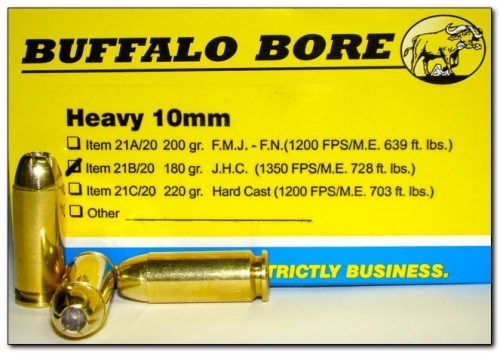 The Buffalo Bore Heavy 10MM ammo is the result of many years of customers requests that we produce several such loads for the 10MM. These loads bring out the full potential of the 10MM but operate at standard pressures and as such, are safe to use in any standard 10MM pistol. Please don't phone us and ask if these loads are safe in your 10MM - THEY ARE SAFE--provided your 10MM is a normal operating pistol in good condition. Full power 10MM ammo has always generated enough recoil and pressure to require a pretty stiff recoil spring in your handgun - this, of course, depends on several variables such as your slide weight, etc. When the cartridge fires, it generates enough pressure/recoil to prematurely open your breech face in some guns. When this happens, the opening breech face has an effect on the burn rate of the powder. This can result in some fairly high extreme spreads in velocity. If you are experiencing extreme velocity spreads of more than 50 fps, simply install a stiffer recoil spring. I have an original Colt Delta Elite. This gun with the factory spring runs extreme spreads of about 35fps with both of these 10MM loads. I am happy with 35 fps, so I leave the Delta Elite as is. I also have a custom built Para Ordnance with a Nowlin barrel. It runs extreme spreads of about 70 fps with its original recoil spring. When I install a spring that is 4 lbs stiffer, the extreme spread drops to about 35 fps. The new Glock model 20 comes with a recoil spring that allows the breech face to open too soon and my new Glock model 20 will get extreme spreads of about 100fps with the factory spring installed. When I go to a stiffer recoil spring, the extreme spreads drop to about 50 fps in my new Glock model 20. Of course, none of this will be an issue in a revolver. None of this will be an issue in real life either, as these high extreme spreads don't hurt accuracy or function. However, I mention this because if you are like me and want things to be as correct as possible, I have outlined the problem and the solution. The industry fixed all these problems initially, by watering down the 10MM ammo over the last several years. The watered-down 10MM ammo does not generate the pressure/recoil to open the breech face early. If you want the full powered 10MM ammo we make, you simply need to tweak your pistol. Or just realize that you are getting some fairly high extreme spreads and ignore it or live with it. It's not hurting anything in reality. Been shooting this ammo since Glock released the G40 long slide 10mm. Finally got to take a whitetail with it this season. 46 yards through the lungs. Deer ran 15 yards and piled up. Great blood trail. Great penetration (whole way through), broke 3 ribs, and lots of energy transfer on the entry side. Awesome ammo. Just purchased a glock 29 gen4 and a box of your 180gr . Tested your fine product along side 3 other defensive ammo rounds, definitely can tell the difference. This is my first Buffalo Bore purchase and I'm sold! Ya'll make a very fine product keep up the good work. I just evaluated it my little Glock-29 with a KKM match barrel. Using a chronometer I measured the velocity of the 180 grain hollow point bullets at 1318 FPS. It was rated at 1350 FPS. I consider my results as remarkably fast for such a small barrel! It fed flawlessly. The recoil was not painful. This ammo is awesome. Tight groups and manageable recoil. Easy follow up shots. I carry my g20 sf loaded with the 180 gr jhp everyday. I wouldn't trust my life with anything else. This 10MM is advertised at 1350 fps and 728 M.E. I shot it from a Dan Wesson PM7 and got an average velocity of 1382 from a five inch barrel. That is some 768 FPE! This will be my go to round for hunting and carry! Highest velocity recored from 10 feet from muzzle was 1393, and lowest was 1372. You cannot do better than that! Great ammo! I ran across a group of wild hogs during deer season this year and they were well within pistol range. I dropped two dead in there tracks, both with head shots and a third made it 15 yards with a shot to the vitals.I was shooting my colt delta elite 10mm with the 180gr JHP. I highly recommend this ammo for both hunting and defensive roles. Wonderful ammo. Never once had a malfunction with it, and always holds tight groups. I carry it in my Glock 20SF with a 22lb ISMI recoil spring and captured guide rod.. 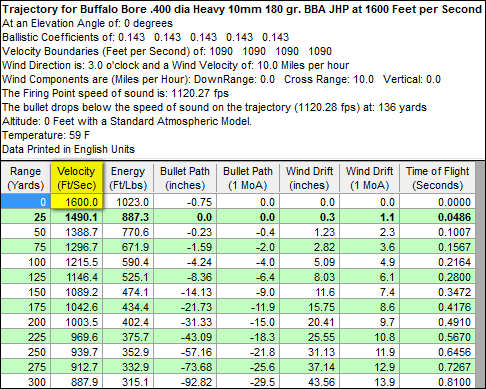 I chrono an average 1283fps at 658ft lbs of energy with a standard deviation of 24fps and an extreme spread of 55fps. Awesome! Accurate and powerful. Glock 29 with a new KKM barrel and this ammo gave resulted in such a tight 3 shot group at 10 yards (cloverleaf, all touching) that I stopped shooting to save the rest of the rounds. That's off-hand, no rest, etc. Wow!! 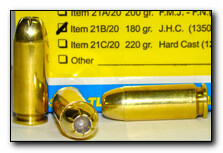 There is nothing out on the market that compares to this 10mm load period! I fired a few rounds of this ammo through my Glock 29 and was amazed at how powerful it was. I have shot many different brands of defensive 10mm ammo and nothing even comes close to this load. If you have a 10mm that you use for a carry gun I would highly recommend this ammo!